Smoke will always be one of the toughest odors to remove whether it is from cooking, smokers or from wildfires in your area. The smell of smoke tends to permeate fabrics and fibers and lingers in the air long after the fire is gone. 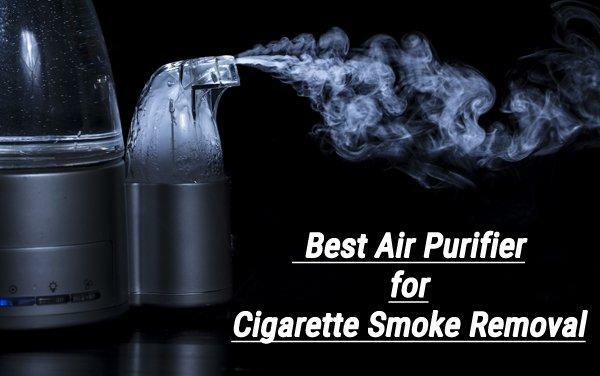 There are products that are supposed to help get rid of smoke from smokeless ashtrays to exhaust fans for cooking smoke and odors but those only get rid of the actual, visible smoke. They rarely do anything for the odors left behind. An air purifier, especially one with special odor trapping filters can help get rid of these smells. You will need to select the one that is the best for the area you are using it in most of the time. For instance, you would need a larger unit for a living room or kitchen area and a smaller one for bedrooms or enclosed spaces. There are even personal sized units that you can place on a desk to help eliminate troublesome odors in your immediate area. It is important to know some terms before you shop. These include CADR or “clean air delivery rate” and CFM which is “cubic feet per minute”. The CADR is how fast the air is purified and returned to the room and the resulting number is given in CFMs. The higher the CADR, the better the unit works at cleaning your air. You will notice that the same unit will have a different CADR for everything from pollen to smoke odor. Use the number for what you find is most important. 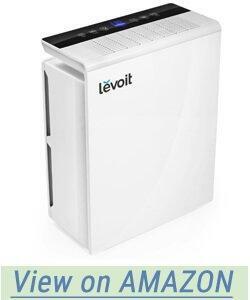 The Levoit LV-Pur131 Air Purifier uses a 3 stage filtration system without creating harmful ozone in the process. It features several modes of operation including a smart mode that tests air quality and then sets the fan speed to quickly and efficiently clean the air. Sleep mode sets the fan to low so there is very little noise. During regular mode the noise is under 50 decibels or about the sound of a normal conversation. This air purifier is Energy Star certified to be energy efficient and is FCC/CE approved so it will not interfere with electronics or other appliances in the area. There is a 2 year warranty and lifetime support. The filters last an average of around 6 months. Despite some issues with filters that may need replacing quicker than most people would prefer, this is a good unit for rooms of up to 322 square feet. The benefit of being Energy Star certified means that you won’t be overpaying to keep the unit running. Be aware that there were a few reports of obviously used units being sent out to customers as new. Always carefully inspect any purchase no matter where you buy it and know the return policy before you shop. Able to capture ashes and debris. Three stage filtration system designed to handle smoke. Does not use or create ozone during operation. Filters may need to be replaced frequently. Some concerns that returned units are being sent back out as “new”. The Pure Zone 3-in-1 Air Purifier has three filtration stages including a pre-filter, an activated carbon filter and a True HEPA filter. The fan has three speeds plus a filter replacement indicator light so you never have to worry about missing a filter change again. The CADR is 80 CFM and the unit is rated for around 200 square feet. 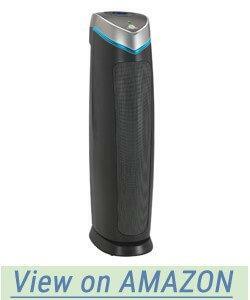 An optional UV-C air sanitizer can be used to kill germs, bacteria and viruses during cold, flu and allergy season. It has very low noise levels on all three speeds with decibels ranging from 30 to 50. 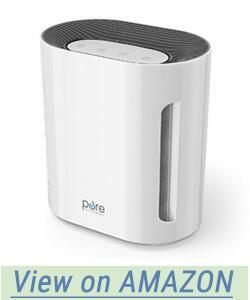 The Pure Zone 3-in-1 air purifier also has a timer which allows you to choose 2, 4 or 8 hours of operation. There is a five year warranty on this air purifier. As long as you keep in mind the size limitations this unit should be fine. It is quick to set up, easy to use and is as quiet as possible even at high speed. It is a good unit for homes where people are frequently sick or for people who have problems with seasonal allergies. Incredibly quiet during operation at all three speed levels. Timer allows you to set the purifier in a room and then walk away knowing the unit will shut off at the end of the time. Some reports of a plastic like, burning smell during use. The fan may be too weak for overwhelming smells or a lot of smoke. 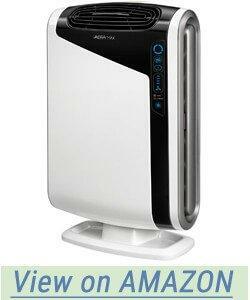 The AeraMax 300 Large Room Air Purifier can handle the air in rooms of up to 600 sq. ft. with its 4 stage filtration system. A smart sensor will keep track of the air quality in your room and will automatically adjust the fan’s speed so that you are never second guessing and having to fiddle with buttons and settings to have pure, clean air to breathe. This air purifier is one of only a few to have been certified as asthma and allergy friendly by the Asthma and Allergy Foundation of America, a non-profit organization that provides information, guidance and tips to families with a loved one who may face breathing challenges inside and outside of their home. The AeraMax 300 has a high performance mode that is recommended for use during the allergy, cold and flu season. There is a 3 year warranty on this air purifier. 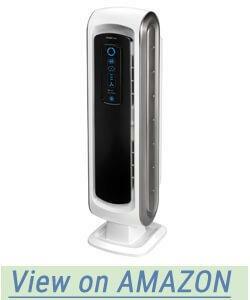 This is a heavy duty air purifier, capable of moving a lot of air in a larger space. Do keep in mind that it can be pretty noisy especially at higher speeds but the noise level is what you would find in most other powerful home appliances. It is not above what you could quickly get used to hearing. Perfect for people with any breathing issues. Has the advantage of certification from the AAFA. A smart sensor monitor keeps track of air quality for you. May have a notable odor during operation. This may pass but some units continue to have this smell even after being in use for a long period of tim. The Germ Guardian AC525OPT air purifier is a three stage system with a Pet Pure HEPA filter plus a UV-C Sanitizing option. Pet Pure is the name given to an anti-microbial agent used to help kill the growth of mold, mildew and odor causing bacteria that may form on the surface of the HEPA filter. In addition, an activated charcoal filter helps to reduce odors from pets, smoking and cooking. 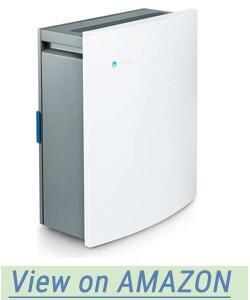 It is an Energy Star certified AHAM verified appliance capable of purifying the air in rooms of 180 sq. ft up to four times every hour. It has a CADR of 126 for dust, 128 for pollen and 116 for smoke. Filters should be replaced every 6 to 8 months depending on the conditions and amount of use. There is a 5 year warranty on this air purifier. Fairly small in size, this unit can purify the air in rooms of around 180 square feet. It might be perfect for smaller rooms that are not overly dusty or beset by overpowering odors. It may struggle when faced with real challenges or in larger rooms. This might be the right air purifier for a nursery. Most infants can quickly adapt to constant sounds and may actually be comforted by them. There have been several reports of possible defects in some units which may lead to fires. Always inspect your air purifiers and monitor them during use. While these may be isolated incidents, it is important to be aware of the potential risk. Pet Pure antimicrobial to kill off some of the toughest odors. Activate carbon filter can handle the smells from household cooking and smoke. Energy Star certified to use less energy during operation. Becomes very loud when the filter needs replaced. Lights are bright especially at night with no way to dim them without turning the unit off. Some potentially dangerous situations involving short circuits and potential fire risk. Please use with great caution. The Veva 8000 Elite Pro Series air purifier uses a 4 stage filtration system to remove allergens, dust, pet dander and everyday odor from cooking, smoking and pets from the air in your home. Rated for up to 325 sq. ft., this air purifier is up to 99.97% effective. It has three fan speeds from quiet to turbo and is 100% ozone free during operation. Filters should be changed every 6-12 months depending on conditions and amount of use. There is a safety feature for this air purifier that prevents it from turning on and/or automatically shuts off if the front panel is removed for any reason. 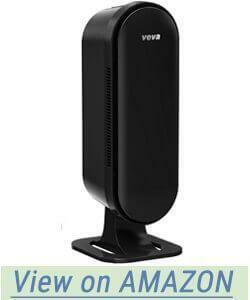 The Veva 8000 Elite Pro Series air purifier can handle roughly 325 sq. ft. making it good for medium sized rooms or smaller areas where odors may be especially concentrated like kitchens and pet areas. The filters are longer lasting than many on the market under average circumstances which is a huge bonus. Keep in mind that this unit can be pretty loud even on “quiet” but it is no louder than any other appliance that you may have in your home. Lifetime support from the company means you never have to look everywhere for the right filters for your air purifier. 4 stage filtration takes care of even tough odors and debris. The unit does have a weird design so changing filters can be a challenge. It is pretty loud during operation but not to an unreasonable level. High tech gadgetry is in every facet of our lives these days and now it has come to our air purifiers. The Blueair Classic 205 air purifier is one of 4 units, three of which are WiFi enabled so that you can pair it with either the Blueair “friend” app or with Alexa and then use voice activation to control the speed of your unit, turn it on or off and check air quality. The Classic 205 Air Purifier can handle a room of up to 279 square feet while the Classic 405 with WiFi capabilities can handle 434 sq. ft. The largest unit is the Classic 605 with WiFi capabilities and it can clear the air in a room of around 775 sq. ft. The Classic 203 is a manually operated unit and can handle a room of around 277 sq. ft. The Blueair Classic 205 air purifier uses HEPA Silent Tech, a filter with an electrostatic charge to pick up and hold more debris down to .3 microns. The unit has a CADR of 180 CF every minute and can cycle the air around 5 times every hour. It has three fan speeds and is Energy Star certified for energy performance during operation. The filters should be replaced around twice per year and are recyclable. There is a 5 year warranty for the Blueair Classic 205 air purifier. A secondary, optional filter called the Smoke Stop is an extra, add on filter specifically designed to be used to reduce the smell from wildfires, tobacco smoke and cooking odors. If you are a high tech guru and enjoy being able to control everything from your favorite device or even by voice activation, this is the air purifier for you. Not only can you check air quality without moving, you can change the fan speeds and turn the unit on and off. If you are looking for smoke control, your best bet is to buy the optional Smoke Stop filter to add to the system. WiFi enabled for tech fans also makes use easier for people with mobility issues. CADR of 180 CFM in a room of 279 sq. ft.
Filters can be recycled after being replaced. Does not support all devices and enabling WiFi may not be as easy as 1-2-3. Unit reportedly has a weird smell described by some as a chemical smell kind of like bug spray. The Silver Onyx air purifier uses a 5 stage filtration system. It starts with a mesh pre-filter to catch the biggest debris. Next up is a true HEPA H13 filter to catch the smaller particles and eliminate most of the dust and pet dander. The third stage of the filtration system is an activated carbon filter which destroys the odors including smoke, pet odors and other household smells. After the carbon filter is a UV-C light which is used to kill germs, bacteria and viruses especially the ones that cause colds and flu. Finally, there is an ion generator which releases negative ions into the air. These ions interact with floating particles and make them clump together into a bigger group. That makes the air easier to clean because the air purifier can stop the larger clumps faster. Available in either white, black or silver, there is a 100% money back guarantee for the Silver Onyx air purifier. It has a 5 speed fan as well as an automatic mode with sensors to test your air quality and adjusts the fan as needed. There is an alert for filter changes which should happen every 6-8 months depending on conditions and usage. It is rated to work in rooms up to 500 square feet. Having 5 filtration stages makes this a pretty powerful unit however, it may not be as capable of clearing a very large room. It is always best to use the rating as just a guideline and assume that it will handle much less. It is always better to be pleasantly surprised than to be sorely disappointed. There is the advantage of the 100% money back guarantee just in case the unit does not live up to your expectations. Available in three colors so you can have a stylish yet functional air purifie. Customer service is really not helpful. May not be quite as powerful as suggested. Some people find the design to be kind of strange. From your desk, your cubicle to your home office or even your bedside table, this is the perfect small and completely portable air purifier to help remove cigarette smoke and help you breathe easier. Very compact so that it fits on most surfaces without taking up too much room, it is capable of cleaning roughly 160 sq. ft. It is fairly quiet running at only 30 decibels on low speed and 40 at the highest speed. As a bonus, there is a small groove located just above the fresh air outlet. This groove is meant to be used as an essential oil dispenser and warmer for aromatherapy. Simply add your favorite essential oils and enjoy the subtle aromas for energy or calming. 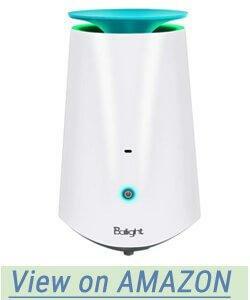 The filter for the Balight Portable air purifier should be replaced after every 3000 hours of use or more often if air quality is not improving quickly enough for you. It has a 1 year warranty and lifetime support from the company. Customer service is available 24/7 on the company’s website. While it certainly could not handle the air in full room, this portable, personal air purifier is good for handling the air in your own personal space. The added benefit of aromatherapy is a bonus especially for the people who could use a little help with either energy or getting calmed back down. The unit is quiet enough to sit on your desk during phone calls and can run at your bedside without disturbing your sleep. Before using any essential oil in this or any other type of device read the labels to make sure that they are pure oils and extracts rather than a chemical blend and some fragrance. The idea is to clean the air not to add more pollutants to it. Small and portable, perfect for offices or bedside. Essential oil groove allows for aromatherapy along with purified air. Very quiet at either speed. The units tend to burn out pretty quickly. Reports of units showing up dead on arrival are too frequent to be considered acceptable and is something the company must quickly address. The Alen Breathe Smart Classic air purifier has 7 different options for filter option and purpose. The main options are: allergies and dust, mold and bacteria, pet dander and odor and smoke and chemicals. Three of the options are also available with an extra filter in a bonus pack. In addition being able to choose your filter set up based on exact needs, you can pick the color of the front panel to match your decor. Your color options here include: gold champagne, brushed bronze, brushed stainless steel, electric blue, espresso, maple, oak, petal pink, safari black, sea foam green, weathered gray, natural maple, rosewood white and a primer panel that lets you add your own custom color to it. Capable of clearing an 1100 sq. ft. room twice per hour, the Alen Breathe Smart Classic is up to two times quieter than comparable brands even during higher fan speeds. It uses a 3 stage HEPA filtration system and has a life time guarantee. The Alen Breathe Smart Classic is Energy Star certified to use about as much energy as a standard light bulb. While it is great that there are so many different options to work with here, from the type of filter set up to the color of the front panel, there are some real things that should give you pause. It is rated for 1100 sq. ft. but may not quite be up to the task. If there is a problem, question or concern the company is fairly slow to respond which is sad as this is also a fairly expensive unit. However, there is a lifetime guarantee and it does conform with Energy Star specifications for energy usage. Covers a fairly large area. Slow response from the company. May not work as well as advertised. The AeraMax 100 air purifier uses a 4 stage filtration system to eliminate odors, dust, germs and more. 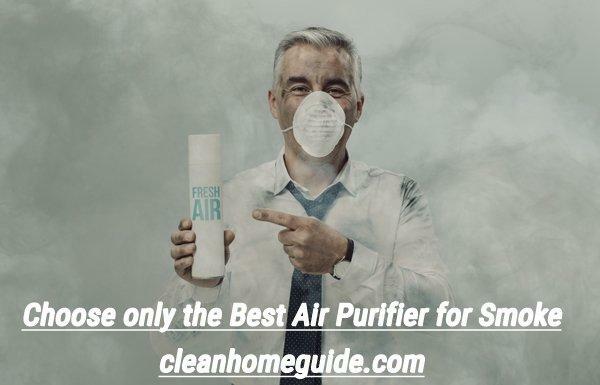 It uses a true HEPA filter that is treated with AeraSafe the companies own antimicrobial agent that helps to destroy odor causing mold and mildew, germs and more as soon as they come in contact with the surface of the filter. Starting with an activated carbon filter for the largest particles and odors including smoke and more. The second stage is the True HEPA filter which eliminates the smaller particles in the air. The third stage is the AeraSafe antimicrobial filter to destroy bacteria, mildew and mold spores. The final stage is the Plasma True technology filter which helps to further eliminate sickness causing germs and viruses. There is an additional, high performance mode which is specifically designed for use during allergy, cold and flu season. AeraMax is one of the few companies that have received certification as asthma and allergy friendly by the AAFA. 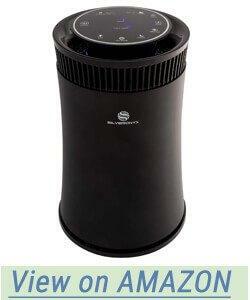 This air purifier is rated for 100-200 sq. ft. and comes in either white or black. Whether you have asthma, chronic allergies or get frequent colds, breathing pure air may be all of the difference in the world to you. This is one of the few air purifiers that get the certification from the AAFA without being break the bank expensive. It can be loud especially at the higher levels but is not anything that you can’t grow accustomed to with a bit of time. The bright lights may be another issue altogether with little real solution to fix it. Certified as asthma and allergy friendly by the AAFA. 4 stage filtration system with antimicrobial and Plasma technology. Automatic performance with the AeraSmart sensor. The lights are very bright on this unit and cannot be dimmed while it is in operation. It makes very loud noises when the filter needs to be changed. 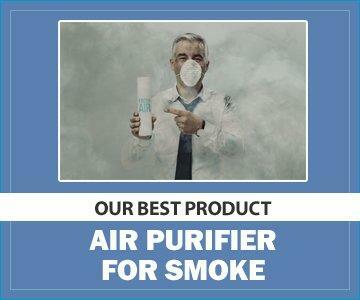 There are several ways to choose the right air purifier. You can choose based on the type of filter or the number of filtration stages. You can choose based on your specific needs. You can choose based on room size or cost of the unit. 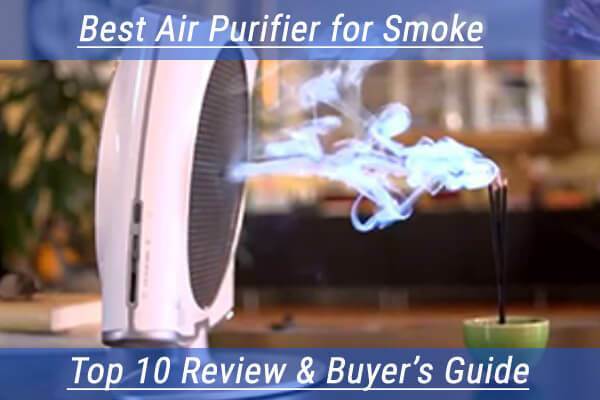 The perfect air purifier would be the one that meets your needs in all of these categories however that is probably not going to be easy to find. You may need to determine what is most important to you and then find the purifier that satisfies that need and is at least acceptable in the other categories. Your best bet is always going to be a purifier with a 3 stage or higher filtration system using HEPA filters. Look for the best unit in your price range and remember that listed room sizes are just guidelines and most units fall just short of meeting those numbers. If your room is 1000 square feet, look for a unit that says it is rated for 1200 or opt for 2 units rated for 600 sq. ft. This way you know that you are covered. While the rated square footage is important, CADR and CFM are more important. You want the unit to be able to move air pretty quickly and efficiently. Remember: the higher the CADR number, the better. Should You Look for Extra Features or Not? Extra features are nice but not necessary. Automatic sensors and filter change indicators are quickly becoming the standard in the industry. WiFi capabilities and pairing with Alexa may become popular enough to be industry standard pretty quickly. If you are a technology lover and can’t wait to have the latest gadget then you might opt for the air purifiers that already have this feature. If the extra features do not push the price out of your budget, go for it. Note: please read the specifications for any of the WiFi enabled air purifiers to make sure that your device is supported. Even if you download the company’s specific app, you may not have the right type of service for the connection to be made. If you have spotty reception in your home these devices may not receive a strong enough signal to be controlled. WiFi enabled air purifiers will probably be something most companies will start introducing in the coming years especially with Alexa, Echo and similar voice activated products being so popular. It will be part of the total automation of the home to be able to check and adjust air quality without even moving. Air purifiers, especially those that are meant to remove the smell of smoke from your home must be a)big enough to handle the room they are sitting in b) have the right type of filters and c) deliver enough clean air at a fast enough rate to be of benefit. Smoke, whether it is from wildfires, tobacco or cooking disasters is one of the toughest odors to get rid of in the home. It can permeate fabric fibers and lingers in clothing, carpets and curtains even with frequent cleaning. The two most effective types of filter for smoke odor of any kind are HEPA filters and activated charcoal or carbon filters. Using both of these types of filters together more than guarantees that the smell of the smoke is going to be eliminated. This may not be immediate though. In some cases the air purifier may need to be in constant or nearly constant operation for several days to a week or longer for the smell of smoke and other strong smells to be removed from the air. It is important to keep up with the maintenance and replace these filters as directed especially in an area that has frequent wildfires or in a home with smokers. During certain times of the year, the filters may need replaced more often than usual. If possible buy several so that you are always ready for a change and never have to delay while waiting for a new one to be delivered. If you have washable filters, follow manufacturer’s guidelines for washing and drying so that you are not introducing mildew to the entire system. Three, four and five stage filtration systems are best at filtering out these tough odors especially in larger, more open rooms. Keep checking air quality, placement of the unit and what fan speed you have to use until you find the right spot. Healthy, clean air is important enough to spend a little time getting it right.